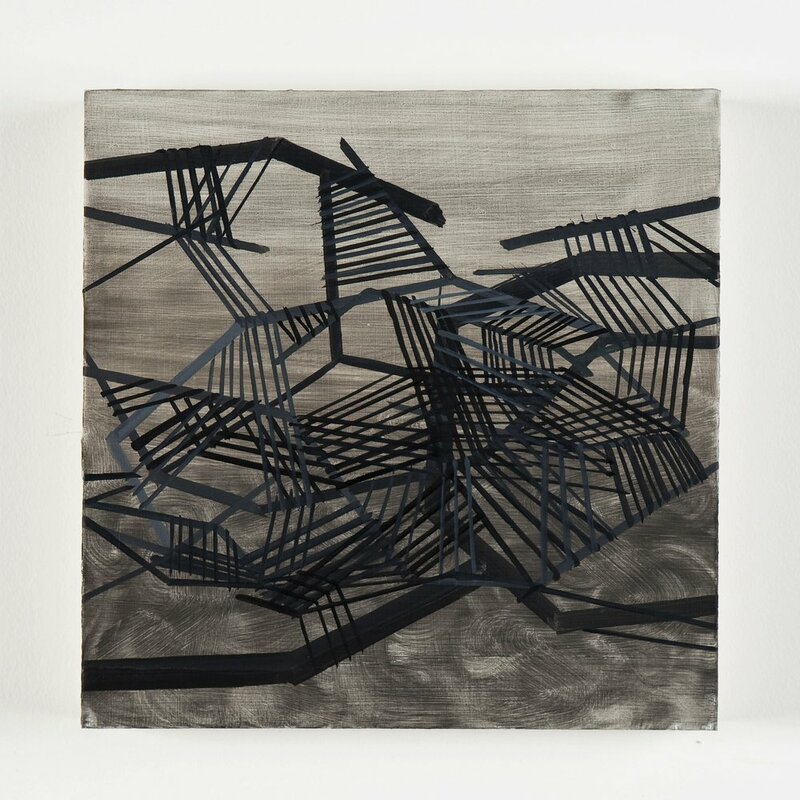 binding mine to yours || 2010 || oil on panel || 10" x 10"
of bearing and holding, still || 2010 || oil on panel || 10" x 10"
steeplechase, I've been here before || 2009 || oil on graphite panel || 10" x 10"
Hamiltonian Gallery is pleased to present a new three-person exhibition of paintings and installations by Hamiltonian Fellows Magnolia Laurie, Lina Vargas De La Hoz and Leah Frankel. By presenting physically binary relationships such as inside/outside and construction/destruction, each artist investigates exchanges of energies, and the ebb and flow of natural and social forces. Within her paintings and installations, Magnolia Laurie creates environments centered upon masses of broken, crooked lines that could resemble a dense, organized nest, the aftermath of a natural disaster or an architectural armature. Due to Laurie’s manipulation of perspective and line quality, these structures are always just short of being logical. Magnolia Laurie’s arrested jumble of lines, flags, plastic fencing, gusts of dusty wind and color all develop into a haphazard system that depicts the automatic, and sometimes incessant, obsessive human need to build and create. Magnolia Laurie relates this act of construction and destruction to the cyclical rise and fall of civilizations. Lina Vargas De La Hoz designs and creates objects that tenant, command, and address its surrounding space. One work, “Pull Over “, is composed of repurposed knit sweaters sewn together and stretched tautly across the gallery so that the neck and armholes are intact. We interact with the plane of sweaters by approaching it from underneath, and putting our heads and arms up through the holes where we can then see the top surface of the installation, and the heads and arms of the other participants. The expanse of blue sweaters cut through the gallery to create two literal and psychological spaces, analogous to above and under water, or penetrating borders. In Leah Frankel’s installation titled (im)Balance, formed spheres of ice nestled in mounds of table salt are flecked throughout the gallery floor. Incontestably, the salt will melt the ice and the water will dissolve the salt, but in that process of cancelling each other out, themes of codependency and dominance emerge. Once the process ends, we are left with ambiguous, geological forms, which depict the results of the destructive exchange between these quotidian elements.